Ivy League Day Camp is situated on 16 shady acres of beautiful park-like grounds and boasts the most comprehensive camp facilities on Long Island. Our excellent outdoor and indoor areas support an exciting array of sports, arts, adventure and aquatics programs. Whether indoors or out, each activity area is equipped with the innovative supplies and materials to provide the perfect setting for developing skills, and having fun in a safe environment. 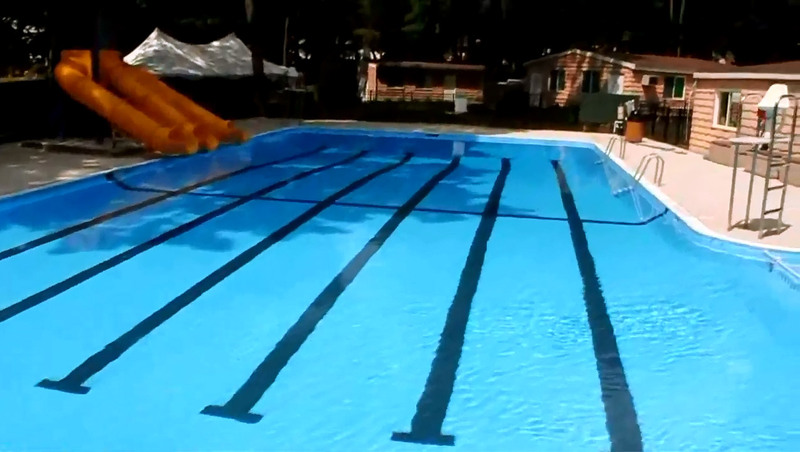 Four outdoor heated swimming pools, each designed for a specific age group, are under the supervision of American Red Cross certified swim staff. We even supply the towels! For our youngest campers, our “Froggy Pool” creates a fun, safe environment, where children learn to swim and play in 18 inches of water. Our “B Pool” allows our younger division to feel confident as they learn to swim in a 3-foot pool. Adjacent to our “B Pool” is our “Deep Water Well,” perfect for our emerging deep water swimmers. Finally, our “C Pool,” ranging from 2-to-10 feet, is our largest pool. It includes 3 slides, numerous swim lanes and hosts our annual swim meet. Our well maintained athletic fields and courts are strategically located throughout the campus and include tennis courts, gaga ball pits, basketball courts, a beach volleyball court, baseball fields, soccer fields, and hockey rinks. Athletic specialists coach campers in the finer points of the games and promote team spirit. An amazing adventure site includes a rock wall, zip-line, high and low ropes course, giant swing, sky bounce and go-karts giving campers the opportunity to challenge themselves and build confidence. An archery range, a golf program including a nine hole mini-golf course, driving range and batting cages give campers plenty of opportunity to work toward their personal best. Two riding corrals can accommodate our youngest pony riders as well as seasoned equestrians. A special campus just for our younger campers provides hours of fun as children develop their large and small motor skills on well-equipped playgrounds and at an intriguing tree house. Scaled down ball fields and courts allow our youngest campers to experience success as they learn the rudiments of various team sports. Mini Campers enjoy their own special areas for crafts, songs and imaginative play, including a tee-pee for storytelling. Young nature lovers delight in our animal farm and just can’t wait to go on pony rides. In addition, our well equipped gymnasium hosts our indoor gymnastics program. With lots to keep young campers moving and exploring, our playgrounds include a one-of-a-kind tree house, a must-see giant web, a rock town for our avid trikers, a life-sized Lego land, as well as more traditional slides, swings, and playhouses. All are age-appropriate and designed for safety and fun. Full time health providers can always be found on campus. They are equipped to handle sudden illnesses, minor cuts or bruises and administer prescription medication as needed. A covered dining pavilion provides space for our campers to sit and relax with friends while enjoying a child-friendly meal. Counselors serve our younger campers and older campers are served buffet style. Campers and counselors eat together to ensure that each child eats a healthy meal. Each week, campers enjoy a traditional summer cookout prepared on our barbeque. Locker rooms contain marked cubbies where campers may store their personal belongings and change for swim. Separate boys and girls facilities are located throughout the campus. A central gathering place provides the setting for meetings and assemblies where camp traditions are passed down and where awards ceremonies and birthday celebrations take place. Singing competitions, dance groups and individual performers can take to the stage and strut their stuff. A large, well-equipped, air-conditioned gym houses additional activities such as gymnastics, and with the magic of lights and professional stage, this space is transformed into a performance center for children‘s productions and special assemblies. This space is also equipped with a full-sized screen, allowing campers to view movies, slide shows, and other media during our rainy days and special events. Complementing our spacious fields and courts, several indoor air-conditioned buildings house a variety of arts and crafts activities. There are separate areas for older and younger cooking, leather, woodworking, creative depot, early childhood art studio and a ceramics studio complete with a potter’s wheel and kiln. 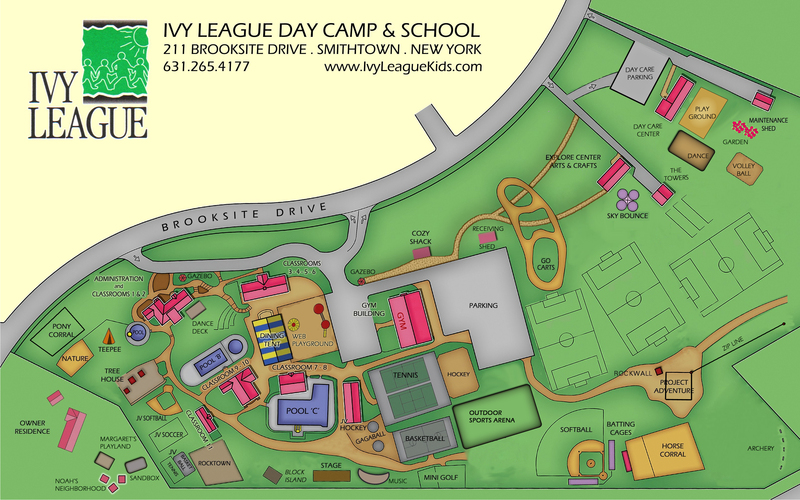 Ivy League Day Camp Map. Click image to download.